ONE knows of course that it exists but, from time to time, when one comes upon the truly seemy side of art  the grime and the grease of commerce associated with it  the jolt one feels is even severer than usual. There is this great row that is currently raging in Spain, and in other affected parts of the world, over the work and estate ofSalvador Dali, that quirky genius, whose name is enduringly linked with Surrealism  bringing the worlds of dreams and art together  on the one hand, and with eccentricity on the other. Dali died close to 10 years ago, leaving behind a vast, if uneven, body of work, and a huge estate. Before his death, he had set up a Foundation to care for his artistic work, and a Company that would administer his intellectual property rights. 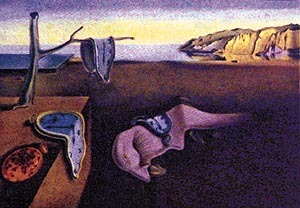 But, as in Dalis wonderful early paintings, nothing is happening as might be expected. The two bodies are locked in mortal combat at the moment: court cases, allegations and counter-allegations, pieces of fur flying in the air. Both the bodies are accusing each other of not "delivering" what they were meant to. It is much coarser than would appear from these words, for strong, dogged personalities are involved at a personal plane. Among the "politest" of exchanges  this would give one an idea of the tenor of things  is the accusation that the other party is using "lies, pressure, threats, trading on influence, intellectual terrorism, and despoilment". It is being said in the art world that: "During his lifetime Dali seemed to enjoy leaving chaos in his wake, and he has not lost his masterly touch." At the heart of it all  even though there is more to it than this  is the issue of what are called the "Dali fakes". Any catalogue that you pick up, any journal of art in the western world, and you are bound to be struck by the number of Dali prints  not reproductions, but graphic prints, individually signed, and numbered, as is the standard practice  that are on sale. A great many of them are apparently fakes. Dali, they say, might be the most forged artist in history. But, for this he himself, at least in part, is responsible. The vast majority of the prints on sale date from the 1960s when Dali, riding a wave of popularity, vogue, began to sign sheets of blank paper for the publishers of his prints. A conservative estimate puts the number of such sheets, on which genuine Dalis were printed, at a little less than 30,000. But one person a former associate of Dali, says the number might have been close to 5,00,000. The result now is utterly chaotic. There are, on the market, authentic prints with forged signatures, and forged prints with genuine signatures (on pre-signed paper). Then, of course, there are fake images with fake signatures. All this is big, enormous business, because prints do not come cheap. It was estimated by one American lawyer  that is where the biggest Dali market naturally is  that fake Dali prints of the value of close to six hundred million dollars (how much is that in rupees, I wonder?) are in circulation. Whose job is it to fight this? Since this involves intellectual property rights, the Foundation says that the Company should have been more vigilant. The Company, on the other hand, thinks the Foundation in interfering in its work. The Foundation thinks that the person chiefly responsible for running the company is not qualified to pass judgements about authenticity, for he is "a photographer, not an art historian". That gentleman, however, contests this hotly, and continues to write open, angry letters in the papers to his "late friend, Salvador". It is all a little bizarre. But, at a more material plane, some cases instituted by the Company against fakers did succeed: in New York state alone, 70,000 prints were sized and people responsible prosecuted. A French court, after many years of investigation of fraud charges, ordered 90,000 prints destroyed. This is a scale of business that one cannot even imagine in our own land for, what is being spoken of is not, one should reiterate, printing press reproductions, like calendars or posters, but graphic prints: issued in limited editions and with the signatures of the artist, things that invest them with value, if not true uniqueness. Where does this leave Dali, the artist? Lost in the fine, choking dust of commerce. It is only with an effort that one can recall, in the midst of all this, his signal role in the art of the twentieth century. So much of it owes itself to him: Pop art, happenings, abstract expressionism, conceptual art, installations... Especially difficult, in the midst of the present seaminess, it is to recall those wonderful, early works of his, like "the Persistence of Memory", which are supremely serene on the one hand, and disturbing on the other. That one work, with all those melting, soft watches spread out in a barren landscape under a never-setting sun, as if to dry in eternity, has been described as "a haunting allegory of empty space in which time is at an end". Ants crawl about as if poised to devour the hard, metallic watch; the landscope with its eerie silence, stretches away to infinity. Dream imagery, that staple of Surrealism, is not new in art. But in the hands of men like Dali it acquired a new life, as it were, a studied exploration of incongruities. It is interesting, however, that the method he, and his fellow-artists of this persuasion, followed in his early, Surrealistic work, seems to have been suggested by an obscure nineteenth century French poet, Ducasse. In one of his works, the poet had spoken of a situation "as beautiful as the encounter of an umbrella and a sewing machine on a dissecting table"!